Roy Madden was born on December 24, 1937, in Oklahoma. He enlisted in the U.S. Air Force on October 6, 1955, and completed basic training at Parks AFB, California, in December 1955. His first assignment was as a Fabrication, Leather, and Rubber Products Repairman with the 320th Field Maintenance Squadron at March AFB, California, from January 1956 to April 1960, and then with the 22nd Field Maintenance Squadron at March from April to October 1960. Sgt Madden served with the 4082nd Consolidated Aircraft Maintenance Squadron at Goose AB, Labrador, from October 1960 to January 1962, and then with the 4126th Field Maintenance Squadron at Beale AFB, California, from February 1962 to January 1963. His next assignment was as an Aircraft Instrument Technician with the 456th Field Maintenance Squadron at Beale AFB from February 1963 to November 1965, followed by service with the 525th Fighter Interceptor Squadron at Bitburg AB, West Germany, from November 1965 to February 1968. Sgt Madden served as an Aircraft Instrument Technician with the 2951st Combat Logistics Support Squadron at McClellan AFB, California, from February 1968 to February 1969, and then as an Avionics Instructor with the 3346th Instrument Squadron at Chanute AFB, Illinois, and then at Pease AFB, New Hampshire, from February 1969 to July 1971. His next assignment was as a B-52 Stratofortress gunner with the 744th Bomb Squadron at Beale AFB and deployed to Andersen AFB, Guam, from July 1971 until he was forced to eject from his aircraft over North Vietnam and was taken as a Prisoner of War on December 20, 1972. After spending 55 days in captivity, TSgt Madden was released during Operation Homecoming on February 12, 1973. He was hospitalized to recover from his injuries at the David Grant Medical Center at Travis AFB, California, from February 1973 until he was medically retired from the Air Force on May 28, 1974. Roy Madden died on January 5, 1997. 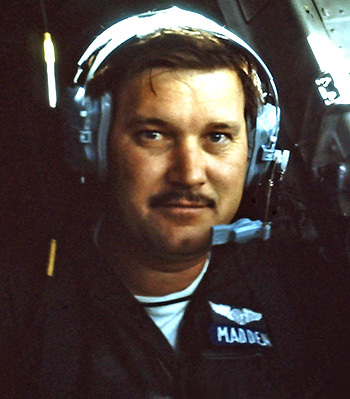 Staff Sergeant Roy Madden, Jr. distinguished himself by heroism while participating in aerial flight as a Fire Control Operator near Hanoi, North Vietnam on 20 December 1972. On that date, as a crewmember of a B-52 engaged in one of the largest conventional bombing raids ever amassed in the recent history of aerial warfare, Sergeant Madden was forced to bailout over hostile territory as a result of significant battle damage to his aircraft as the result of extremely heavy hostile fire. Sergeant Madden and his crew were in quest of massed supplies, communications equipment, and transportation lines in order to eliminate the aggressor's capacity to initiate an offensive, and despite receiving heavy battle damage and incurring grave personal danger Sergeant Madden and his crew were able to destroy the target before being forced to abandon their aircraft. 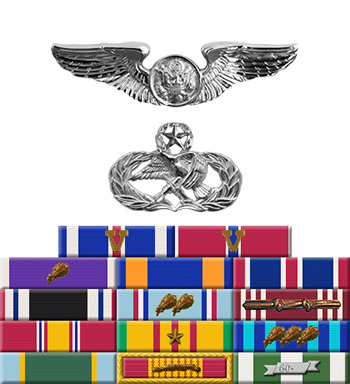 The outstanding heroism and selfless devotion to duty displayed by Sergeant Madden reflect great credit upon himself and the United States Air Force.